The Smart Stand is the perfect solution for a production line with limited space and a steady flow of trays. The Smart Stand comes with a custom-made-to-tray Smart Tool and an integrated programmable control unit. We made everything easy for you. The Smart Tool can be effortlessly removed and another placed in the Smart Stand. The stand itself is constructed in stainless tubes, making cleaning easy. The denesting is servo driven - giving you complete control of every stage of the denesting and freedom from the need for compressed air. When you need to change to a new tray you can do so and be up and running again within 2 minutes. The Smart Tool can endure thorough industrial cleaning, adhering to strict hygiene standards. 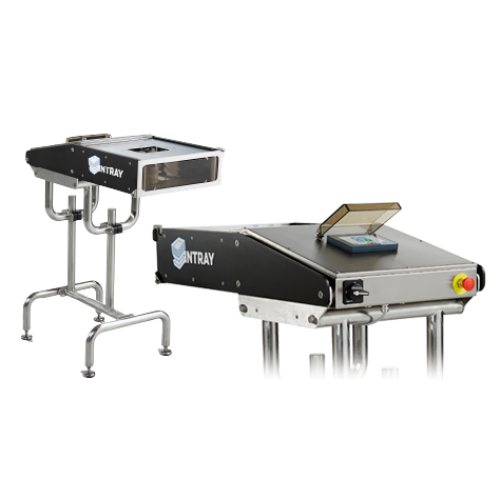 The complete tool is accessible for your cleaning crew, to ensure that any part in contact with the trays are as clean as the rest of your production line. With INTRAY Smart Stand you have a denesting solution that will make unreliable manual denesting obsolete and return your investment as fast, easy and clean as INTRAY denests.